Simple, elegant and Green! 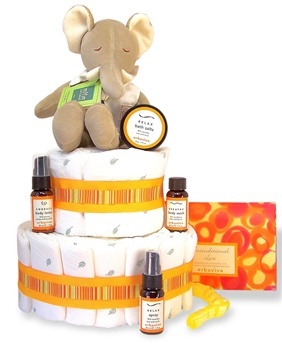 This adorable diaper cake includes 35 Nature Babycare Biodegradable Chlorine Free Disposable Diapers, 100% pure organic plush monkey or elephant (please make a selection below destined to be a child's favorite companion, Erbaviva Organic Relaxing Bath Salts for Mom, Erbaviva Organic Sensual Body Lotion for that itchy belly skin, Erbaviva Organic Relaxing Room Spray, and Erbaviva Organic Invigorating Body Wash for those summer days! Perfect for a boy or a girl - just change the ribbon color and you have yourself a memorable new baby or baby shower gift! We take great pride in each of our products. Each and every item in this unique diaper cake is carefully selected and is sure to be used and re-used by the new parents and treasured by the new baby!